I’ve posted a few blogs over the last year about making more people-centred places – and have mentioned lots of ideas, but not a great deal of practice. Which is a little ironic, since most of my work is on real projects. So, let me redress the balance a little by giving three brief examples of how we – meaning me and other people I work with – are working to put people-centred placemaking into practice. We’ve not got it right yet. But we are trying to be progressive and learn as we go. 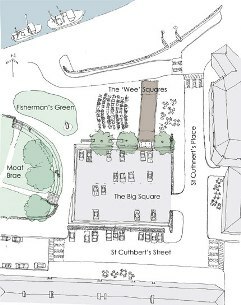 The redesign of Harbour Square in Kirkcudbright, the central public space in a busy small town in southern Scotland which swells with tourists in the summer. The challenge was to draw up a fresh, viable future for this mix of car parking, public toilets, working harbour and old bus depot, surrounded by busy shops and a small park and castle ruins. So, rather than dreaming up wonderful proposals and then sell them to a sceptical local community, the design process was rooted in school classroom sessions, meetings with local groups, and one-to-one discussions with local businesses – culminating in community workshops where local people co-designed proposals with professional designers as equals. At our first workshop we deliberately turned up with blank sheets of paper – to initial disbelief from those who came, but then increasing trust as we explained that we needed to understand their perspective before we could even contemplate proposals. At the second workshop, in a packed town hall, we asked local people to divide themselves into groups and to design how the square should be. The result: lots of ideas, increasing consensus, momentum and trust, and proof that the much-maligned Public Meeting can be a huge success – if it is faciliated well. You can see some images of the final proposals on Willie Miller’s website here. But what was just as important as these proposals was the positive spirit that was engendered through this collaborative design process. In an era of scarce public funds for schemes like this, that positive momentum will be absolutely fundamental for delivery of the project. And, in a town where the community has already built and operates the local swimming pool, we have no reason to think that the local community won’t succeed with this project as well. In a masterplanning project for the long-term growth of Inveraray, led by Richard Heggie of Urban Animation on behalf of Argyll Estates, we’ve been working to forge links between the local community’s aspirations, the public sector’s aspirations for the town, and the long-term desire of an enlightened landowner. Rather than simply prepare a masterplan for housing growth, the approach being pioneered by Urban Animation is to identify local community aspirations and work closely with local Community Planning partners -who were both surprised and enthused by the opportunity to contribute ideas and consider joined up approaches. The aim is to develop a masterplan to guide Inveraray’s development which doesn’t simply build houses, but meets the needs of the local community, businesses, Council departments, the health service and other public services. Although the masterplan is still under development (more information on Urban Animation’s website here), the likely outcome is that it will contain a mix of housing, recreational space, health facilities and business space – each of which closely matched to local aspirations. And as well as creating a masterplan which really is tailored to the local community, the collaborative process is generating a strong momentum – not least from local politicians, who see the benefit to the town of this integrated approach to planning. Castlederg, in western County Tyrone, has been referred to as the most bombed small town during Northern Ireland’s Troubles. 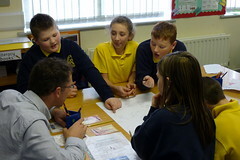 Working with WMUD and Derry based RPD, we worked closely with local Catholic and Protestant schools, primary and secondary, to prepare a new vision for the ruined castle and park – a contentious site laden with competing associations over the last 500 years, most recently as a focus for antisocial behaviour by young Protestant children. The apparently simple act of bringing together young people from across the religious divide to consider the future of a contested public space was an important step forward – in many ways just as important as the actual proposals that resulted. And the proposals themselves, based on young people’s ideas and developed by WMUD, combined an innovative mix of quiet recreational space, community gardening, biodiversity, heritage and performance space for music and events. a new commission with Strathfillan Community Development Trust in Crianlarich, in the Scottish Highlands, is working closely with the local community to co-design their aspiration to develop a heritage and cultural project in the village. The common theme across all of these projects is designing physical proposals which respond to local aspirations, and – equally importantly – take their place alongside wider social, economic and community actions. After all, however wonderful a town’s buildings and spaces are, what are they without people and life?